If you witnessed and haven't forgotten (how could you?) Qualcomm's CES 2013 keynote, then you know the company is brandishing a "Born Mobile" identity as it navigates the chippy waters of 2013 and beyond. The company toes the heavy line that the computing world is increasingly defined by smartphones and tablets. Qualcomm's aim is to position itself at the forefront of the shift, providing chips to the hottest, genre-defining mobile devices of the moment. So far it's been a robust push, at least on the smartphone side: Qualcomm's newest silicon, the Snapdragon 600, is housed in the Samsung Galaxy S4, the HTC One and LG Optimus G Pro while phones like the Nokia Lumia 920, BlackBerry Z10 and Sony Xperia Z feature earlier designs. Qualcomm's dragons are in some tablets too, like the Dell XPS 10 and Samsung Xperia Tablet Z, but Senior Vice President and Chief Marketing Officer Anand Chandrasekher said during the company's "What's Next in Mobile" conference earlier this week that its tech should come to more tablets in the near future. Closer down the road is the company's Snapdragon 800 chipset, capable of hitting 2.3GHz. It's heading into production sometime this month and though the 800 won't officially arrive until the second half of the year, its UltraHD capture and playback capabilities are whetting many mobile appetites. We caught up with Chandrasekher for a one-on-one chat to talk about the reception of the Snapdragon 600, the incoming 800 and why he thinks Qualcomm is fit to win the mobile chip design race. "Generally the feedback for the Snapdragon 600 has been positive," Chandrasekher said. "The best indicator of feedback you have is the design pipeline. We have some 850-plus launches and then the design pipeline has about about 450-plus designs. That's not just the 600 - there's a lot of stuff in it, but it's certainly a part of that." Feedback on specific Snapdragon 800 features happened in earlier development days, he explained, and now the focus is to bring the 4K-capable chip to consumers. "As for the Snapdragon 800, we've had generally positive feedback on that as well. Most of our engagement with our customers [now] will be how do we speed things up, how do we get things out to the market place faster. Those are the sort of things they'd be worried about at this point." While there's evident enthusiasm for smartphones and tablets, PCs (in the laptop/desktop sense) are a bit of sticking point. Whereas Chandrasekher spoke effusively during his conference presentation about Qualcomm silicon heading to products outside of handsets - specifically tablets, smart TVs and cars - the CMO seemed to suggest devices like notebooks will follow only as the mobile market evolves to influence other products. "We're certainly interested in the tablet domain, and we've been making investments in that space for several years," he said. "Our view effectively is that between mobile and tablets, computing gets redefined. "So if you think about these things happening, you're touch interface and the way you interact with the device first started on your smartphone. That has heavily influenced the way you've interacted with your tablet. Tablets happen to be a very touch-oriented interface. "The tablet will fundamentally reshape computing, whether it's notebook or other, simply because of the comfort level with that sort of touch-oriented UI will start to permeate other form factors as well. "We are extraordinarily bullish about phones and tablets. We continue to invest very strongly there, and as those products shape other product categories in their wake, we would hope to follow along in the consumer paradigm and consumer pattern with our products there." 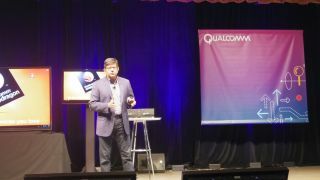 Qualcomm's customers are first and foremost the product partners that find a home for its chips, then send those devices consumers' way. Chandrasekher sees Qualcomm's ability to influence product trends - such as touch - as the oil that lights the innovation lamp.